I'm back with another makeover. 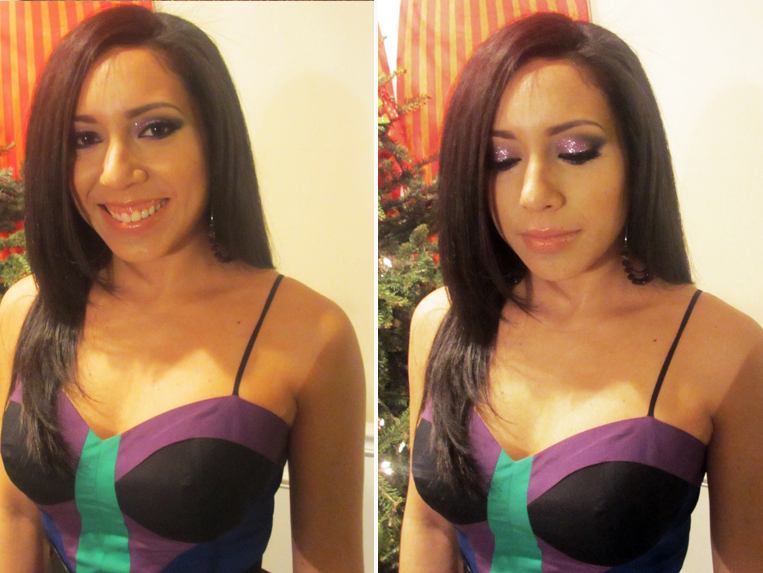 This one features one of my besties and the colorful and glittery look I did on her for New Years. I told Melissa that even if you're not into super bold makeup, New Years is definitely the time wear it's okay for EVERYONE to wear glitter, lol. I've done Melissa's makeup so many times that it's like doing my own, lol. She just let's me do my thang and doesn't look at the product till the end. I love how much she trusts me lol. I asked her to find a few pictures of looks for inspiration. She liked the way this one looked. But she liked the colors in this one. I went for a similar shape but went for a glittery lilac. I was going to put a pop of green on the bottom lashline but ummm we ran out of time, lol. I actually filmed this tutorial but since we ran out of time mid-way i'll just scrap it. Luckily I got pics! Sorry they're not super clear...camera was acting weird. We completely the dramatic eyes with a peachy lip to make the look more wearable. Don't you love her dress? That's all folks! Till next time, Ciao Bellas! shoes, apparel, golf bags and accessories for all .. Dying My Extensions at Home! Product Spotlight: Makeup Mirror Must-Have! New Hair! I'm a Red Head!